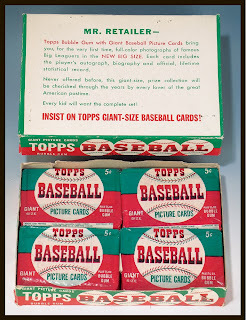 Uncle Doc's Cards: Topps Wax Prices - Inflation or MLB Conspiracy? I see two new followers have joined the fray (Welcome Matt and KW), so yet again, time for me to post something worthwhile. When doing some scant research for my first blog post, “The Essay”, I found lots of pictures of old wax packs and boxes. During my surfing, I began to notice the prices on the wax packs and the boxes. This got me thinking. I wondered how much baseball cards have increased in retail price since the 1951 Topps debut. Nowadays, hitting the card aisle at the local Mall Wart shows that current retail prices are approximately $1.99 per pack for either 10 or 12 cards. Back in my heyday of childhood collecting (i.e., the Bad Wax Era), prices were relatively steady, ranging from 40 to 50 cents per pack. As a kid, I was able to ride my bike to the local pharmacy and pick up 10 to 12 packs for five bucks (since in CA, they didn’t tax cards because they had a “food” product in the pack). All was well in my world until 1992, when packs jumped to 69 cents, and then the untold horror of a 79 cent pack in 1994 that only gave you 12 cards. Before that time, packs ranged from 15 to 17 cards, save for the pre 80s packs that were 5 to 10 cards per pack. Anyways, I wasted a good lunch hour finding the price per pack from 1951 to 1994. Post Strike wax or “power packs” or “blaster packs” do not have suggested retail pricing on the pack or on the box, so they had to be left out of the study. Originally, I wanted to do price per pack and unit price per card, but it became impossible to determine unit price because not all wax packs had the number of cards in them, so we are left only with the price per pack from 51 to 94. Pack prices amazingly held steady at 5 cents per from 1952 to 1969, where they were increased to 10 cents from 70 to 76. Pack prices held their value then for about 3 or so years, and then they went up 5 cents during those intervals. As the hobby boomed and the Bad Wax Era began, prices began to rise more rapidly, and then they skyrocketed (most likely due to “improved” card stock and photography to compete with UD). Another interesting observation for those math nerds out there is that the curve follows an exponential growth pattern. 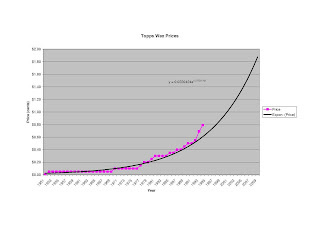 Using a trend line, I found an approximate equation that puts the 2009 pack price at $1.88. Pretty close to retail. So, if all holds true, a pack in 10 years will cost you close to 4 bucks. Let’s hope not! In actuality though, I think the curve is a little shallow, as prices from 98 to 08 were already close to and sometimes exceeding $2. So, why did card prices soar? Was it only because of the increased “quality”, or was there some more sinister force in motion? Next I pulled the average MLB player salaries. I could only find data from 1967 to 2009, so I had to extrapolate the average salaries backwards to 1951. Pretty similar graph, isn’t it? This revealed another exponential chart with salaries skyrocketing around the same time as the pack prices. So, are card prices somehow tied to player salaries? How much does Topps have to pay for an MLB license, and is that correlated to the player’s income? Lastly, I quickly looked up the average household income from 1951 to 2009, and in no way, shape or form does it come close to an exponential growth curve. It is more linear. So, obviously, the increase in card prices has no correlation to personal income. Here’s a link to show this data. 1952 Wax Box - What about Mrs. Retailer?